In partnership with the Louisiana Department of Wildlife and Fisheries and the Louisiana Wildlife and Fisheries Foundation, I unveiled our latest state conservation website - the Louisiana Conservation Connection (LCC) - before the Louisiana Wildlife and Fisheries Commission. Below is an abridged version of my speech to the Commission before giving them a walk-through of the LCC. You can also read the offical press release here. "Thank you Secretary Barham and Jimmy Anthony for arranging our presentation to the Commission. Thank you Kel McInnis and the Louisiana Fish and Wildlife Foundation, and the Walton Family Foundation, which underwrote the project I am about to show you. "[LandCAN] has built a half dozen websites to address the conservation needs of private landowners. 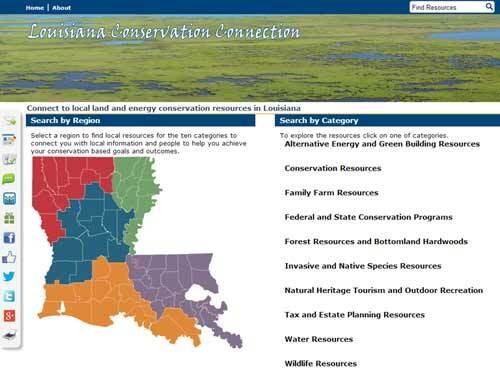 The Louisiana Conservation Connection is our 6th state conservation center, which we have built to complement our two national sites: the Private Landowner Network and Conservation Tax Center. "Why are we doing this? After 45 years in conservation, it is my perspective that since 60% of the continental U.S. is in private ownership, somebody should be talking to and serving that market...and I believe that through a myriad of individual decisions, actions, initiatives and day-to-day stewardship, the actions of private landowners will be the most important marketplace for conservation in coming decades. "We built our state conservation centers to facilitate this process and to bring information down to the local geographic level, and to serve as a B to B, or more appropriately B to C, as in Business to Conservation. All federal programs that touch landowners: USDA, USFS, Interior, and all the Farmbill provisions for conservation. And thousands of for profit business serving rural America: tax and estate attorneys, consulting foresters - all Buck Vandersteen's membership for example - CSAs, clean energy providers, even veterinarians." Don't forget to check out the Louisiana Conservation Connection for yourselves!